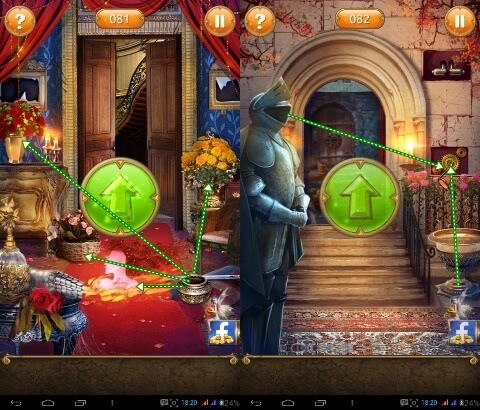 Drag the pot to the vase on the left table, right then press the flower to get water and pour water over the carpet. Drag the pot to the vase on the right table, right then press the flower to get water and pour water over the carpet. Drag the pot to the flower vase on the floor, right then press the flower to get water and pour water over the carpet. Shake your phone to open the door. Pull the knife to the top and bottom wall, press the head of the statue and put the gear wheel down the wall. Move the handle of the lever to the wheel gear and turn the lever to the right. Press the table until it drops and swipe the curtain so that it looks 23 on the wall. Press the numbered circle and press the number 5223. Press each box button on the wall in the correct order then use the key on the table to open the door. Move the container box on the floor to the table and then pour the bundle into the container. Pour the cup on the shelf into the container box, and pour the spoon into the container as well. Move the key pieces into the container and press. Move the spoon to the cup then use the pliers to move the cup to the fireplace. Pour the cup into the container and use the key to open the door.